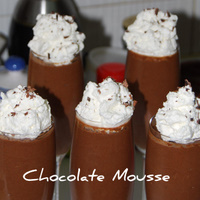 This is the quickest, easiest and most delicious chocolate mousse recipe you will ever make. We add brandy for adult diners.... for kids just miss it out and it still tastes great. Use the highest percentage cocoa dark chocolate for the yummiest result. Serve it in individual glasses for best and most impressive presentation. You can make it the day before and it will happily sit in the fridge until required. 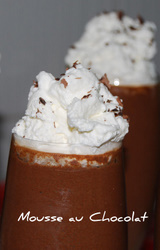 Just top with some whipped cream and grated chocolate when you are ready to serve. Absolutely gorgeous! Break up the chocolate into small pieces and place into a large heat proof bowl over a pan of simmering hot water. Make sure the bowl is not touching the water. Stir until the chocolate has completely melted. Meanwhile using an electric hand whisk beat up the egg whites until they form soft peaks. Gradually add the brandy or liquer and the hot water to the melted chocolate stirring really well. If the mixture is still very thick add a little more hot water to thin it down a little. Carefully fold in the egg whites using a large metal spoon...try to keep as much air in the mixture as possible. When all the ingredients are evenly combined divide between 6 glasses. Put into the fridge to set. This will take approximately 4 hours. When about to serve top with whipped cream and grated chocolate.